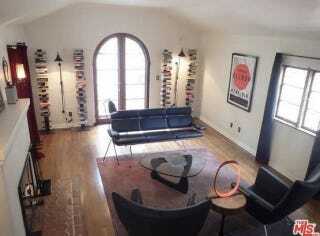 Here’s the just the place to pen your first/next noir masterpiece: James Ellroy’s Hollywood Hills home. The author of L.A. Confidential and The Black Dahlia is selling his three-bedroom 1920s abode for just under $1.4 million. Not included: multiple bookshelves filled with his own works. The three bedroom, and two vintage-tiled-bathroom residence retains a variety of original architectural details, such as hardwood floors and arched windows and doorways, and is furnished in a cinematic if spare manner that echoes Ellroy’s meticulously stripped-down prose. The living room features a fireplace and high-coved ceiling, and opens to a walled garden; the dining room is lit by antique wrought-iron fixtures; and the galley kitchen has a built-in breakfast banquette and slab-marble countertops. A second, corner fireplace anchors the master bedroom where French doors lead to another walled courtyard and, set high on the steep slope behind the house, a separate, studio/office has red brick floors, an exposed wood ceiling, a private terrace and a bathroom that Ellroy had completely covered — walls, floor and ceiling —with appropriately noir jet-black tile. Curbed Los Angeles has a ton more photos (look closely and spot all the framed artwork trumpeting Ellroy’s accomplishments adorning the walls), right this way.